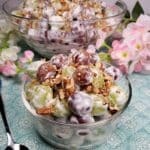 Perfect for a summer gathering, Creamy Grapes Salad with red and green grapes is coated in cheesecake batter and topped with brown sugar and crushed pecans. In a food processor, add cream cheese, sour cream, sugars and vanilla (caviar or extract) and process until smooth. Remove blade from processor, add lemon zest and mix through. Taste and adjust sweetness, as necessary. Pour over grapes and mix through. Refrigerate over night, or until chilled. Mix together topping and sprinkle over grape salad. Wash the grapes with the stems on and then remove them from the stems. This helps to keep water from getting into the grapes. After washing the grapes, I place them in a bowl with a paper towel to help dry the grapes. If you prefer, you can use all white sugar. We all have different tastes, so do what you prefer. Copyright Selkatz, Inc. dba ThisOldGal.com © 2010-2019. Screen shots, copying and/or pasting of recipes to ANY social media sites or blogs are strictly prohibited.